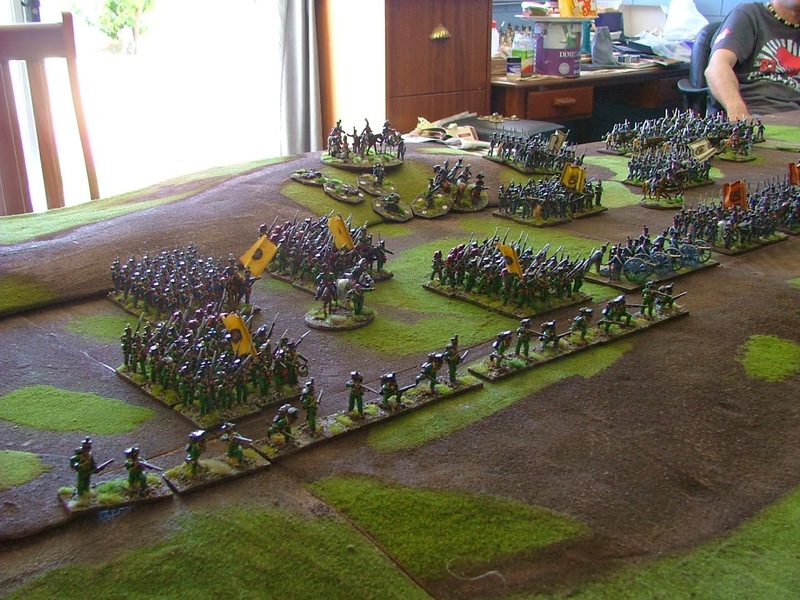 This battle was fought some time ago and I have shared a number of these photographs previously but never in its entirety and never with a full battle report. 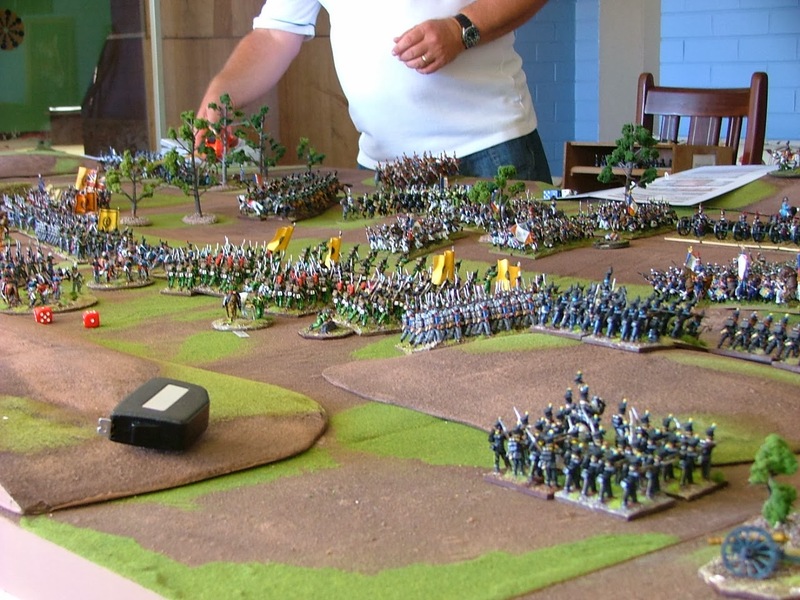 During the summer holidays a few of the boys at the club were keen for a larger battle that could be fought leisurely over the course of a day. Certainly one which would be bigger than those we usually play during the year on a Wednesday evening at the NWS. 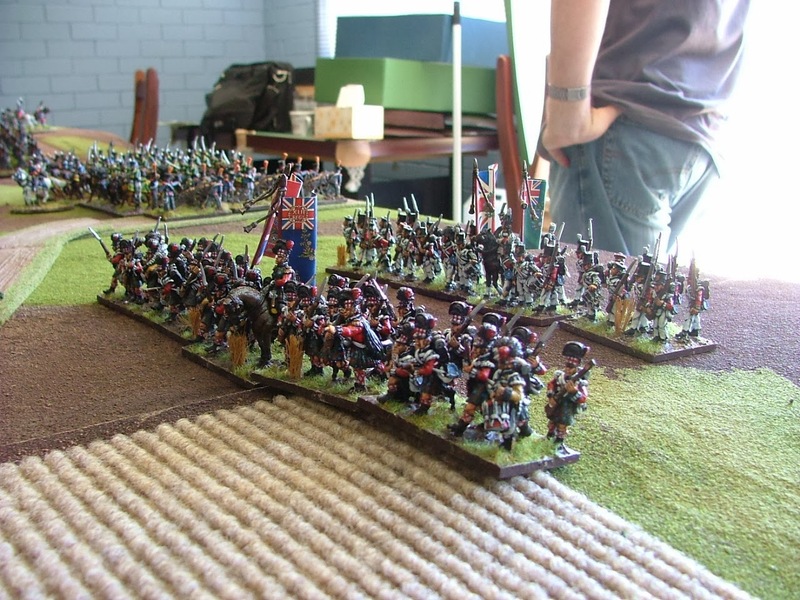 Having the wonderful offer of a day at Steve Yardley’s on his custom built 16 foot by 6 foot, we thought that a large “General De Brigade” was in order and gathered up keen players, troops and refreshments for what was to be first rate encounter in The Grand Manner! 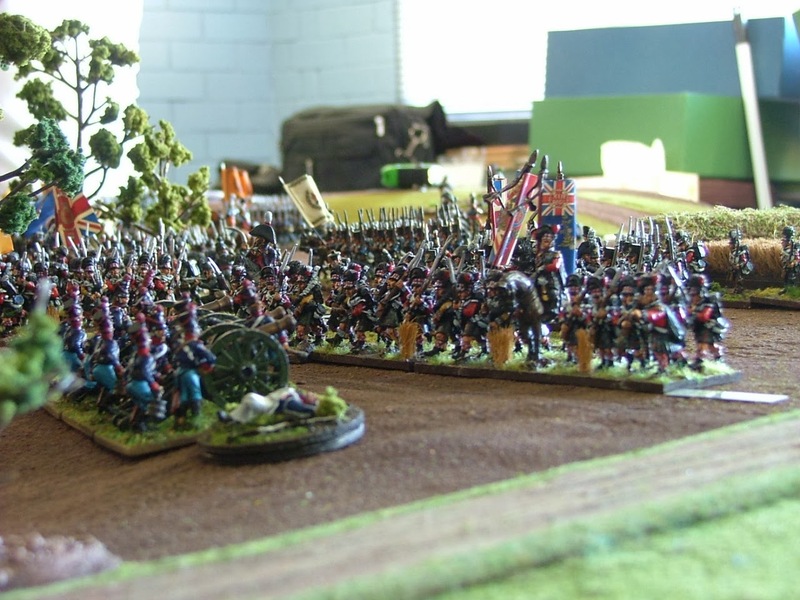 Over the past eighteen months a number of us have been building up our forces for the Waterloo 1815 campaign inspired by the wonderful figures from Perry Miniatures as well as the superb flags from the talented Graeme Black at GMB. 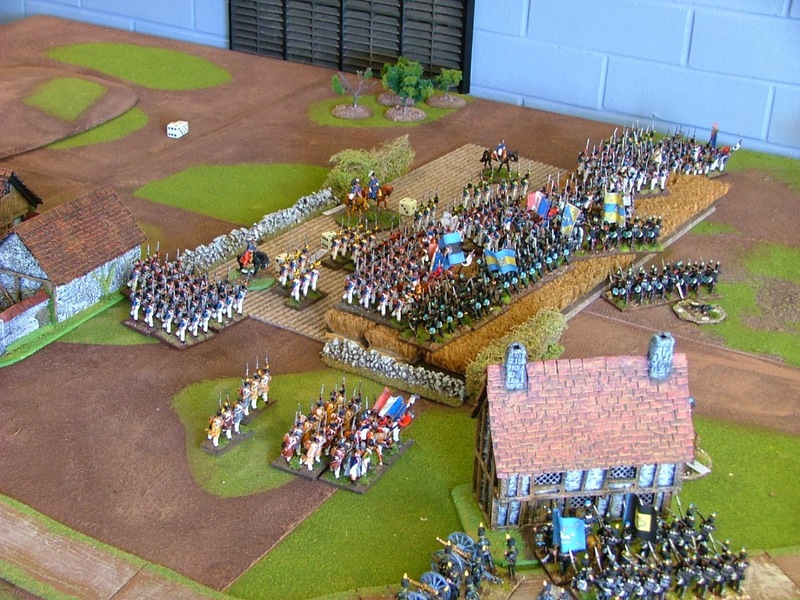 Phil Cook and Martin Street were to be the French commanders and myself, Andy Morant and our genial host Steve Yardley were to play the Allies. Andrew Purves was feigning work however we knew he would turn up eventually! 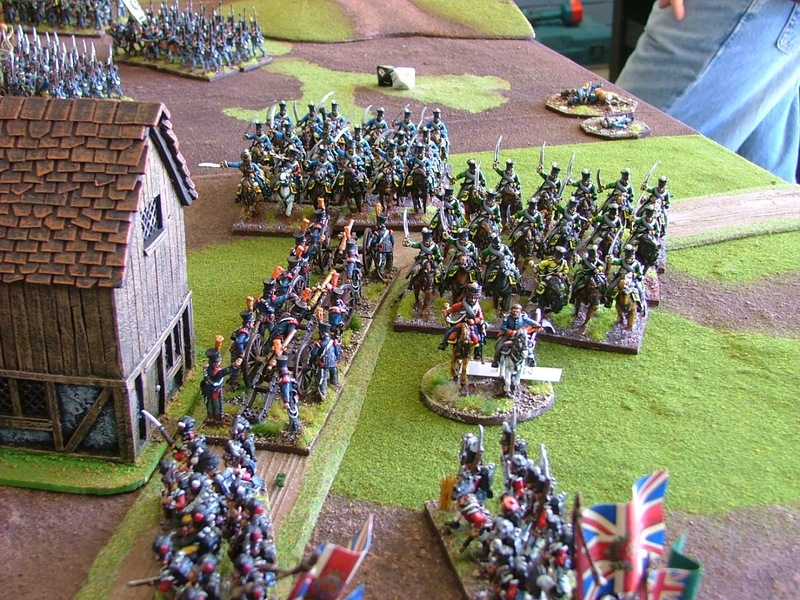 The encounter was to depict a fictional encounter between the French I Corps under D’Erlon with some additional army assets, who were being charged with securing a route for the main army through either one of two critical crossroads located at the Villages of Bon Chance and La Regrette. Standing in their way in order to buy time for the rest of the Anglo-Dutch army was the Prince of Orange and his collection of British, Brunswickers, Nassau and Dutch-Belgians. They were to hold both road junctions and if possible, inflict a crippling blow on the French to try and reduce their effectiveness for the rest of the campaign. 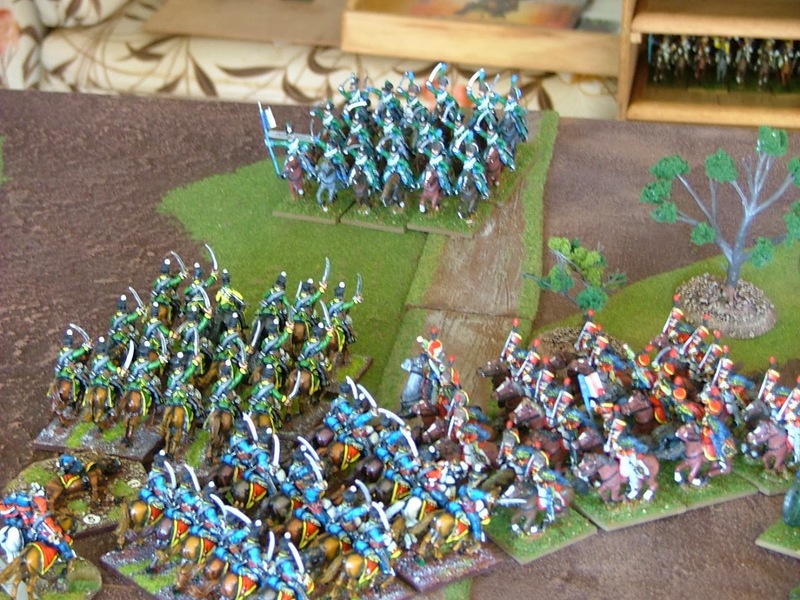 We took these orders of battle from the General De Brigade website and with a few minor adjustments they would suit us perfectly. The French plan was reasonably straight-forward. 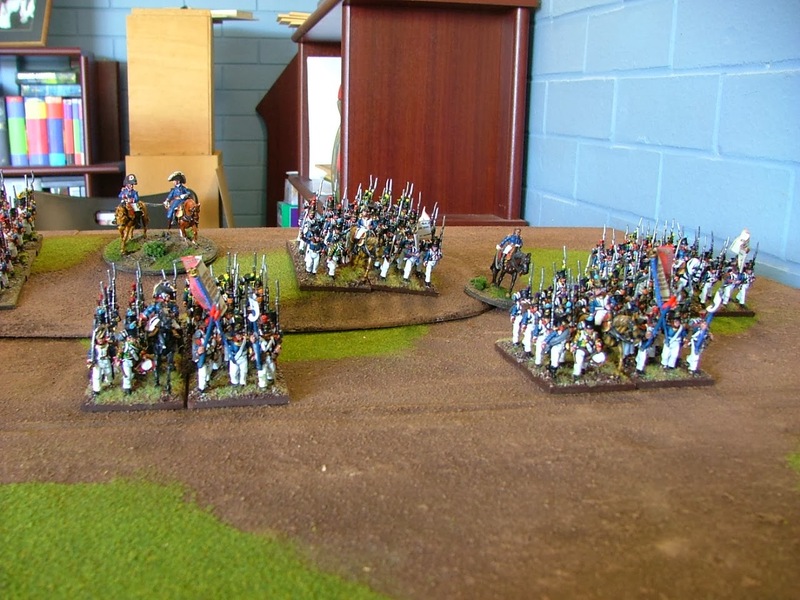 Push hard on their left with Marcognets and Aulds Divisions in an echeloned attack to take the crossroads defended by Brunswick and his support formation of Nassau under Saxe – Weimar. 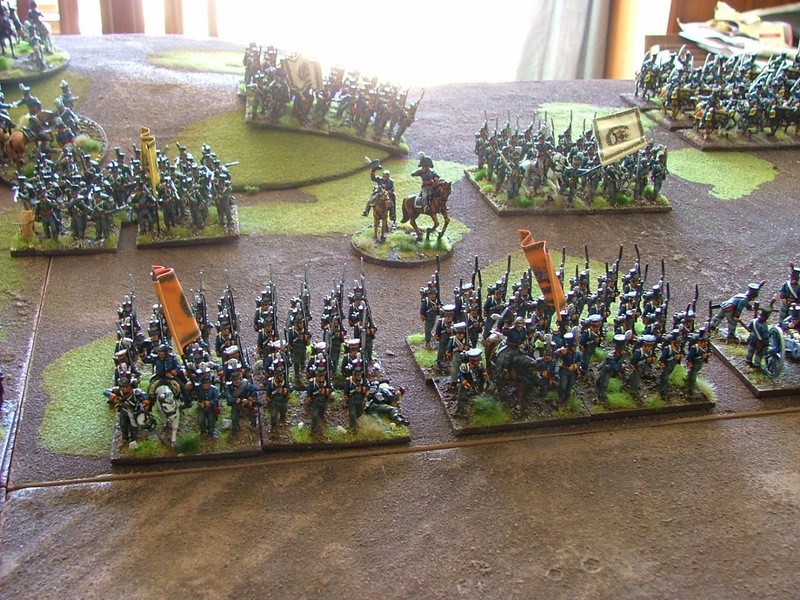 At the same time to screen the Dutch-Belgians of Byljandt and Packs British Brigade with a division of light cavalry troops to prevent them providing support and in turn putting pressure on the flanks of the French advance. The Allied plan was to defend the crossroads in depth and to attempt to turn the French right flank if the opportunity presented itself. 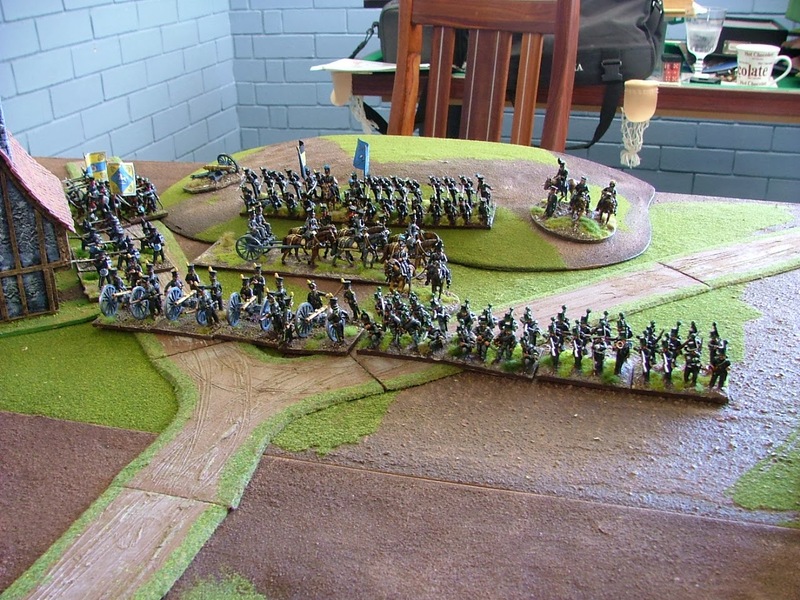 Brunswickers deploy to defend the crossroads on the allied right flank. 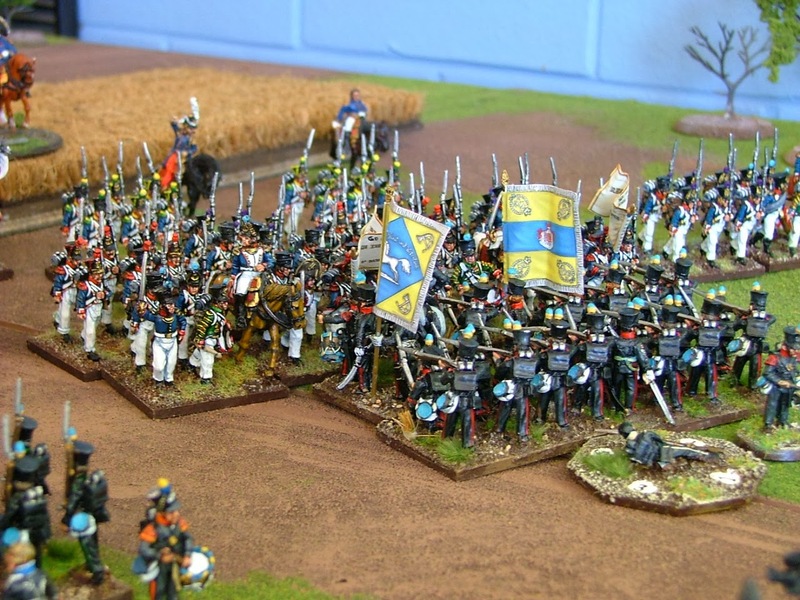 of Jacquinots Brigade as well as Hussars and Chasseurs attached. Marcognets Division in position to advance at all speed. So the battle was joined. 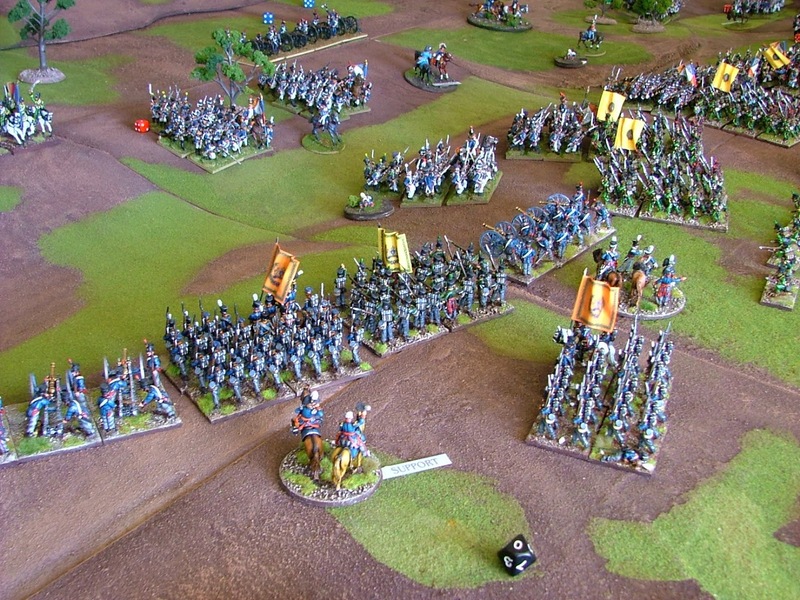 Immediately it became clear to the Prince of Orange that the push was against Brunswick. 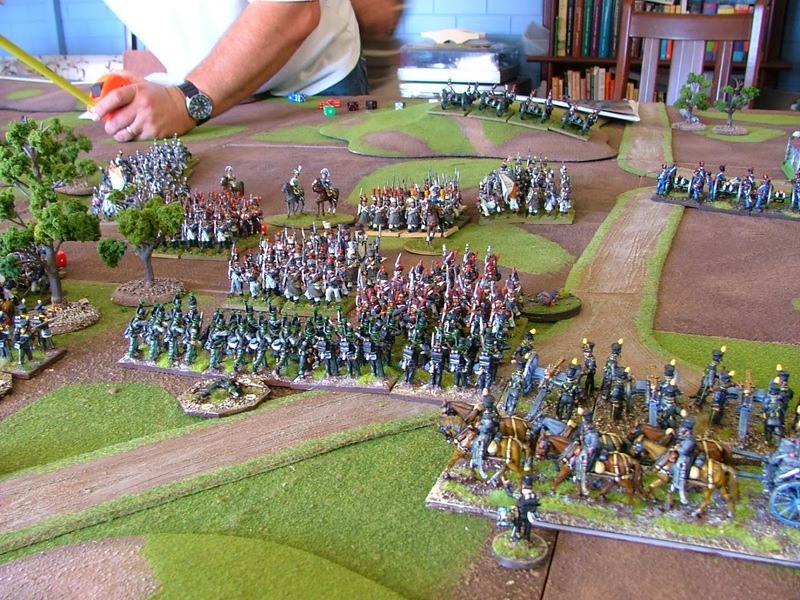 Packs British brigade started to advance on the allied left flank however it became caught up in difficult terrain and was slowed down dramatically. This was not unnoticed by the local French Commander who sent forth his battery of horse artillery and his Hussars and Chasseurs to harry the British troops. fear of a court martial! 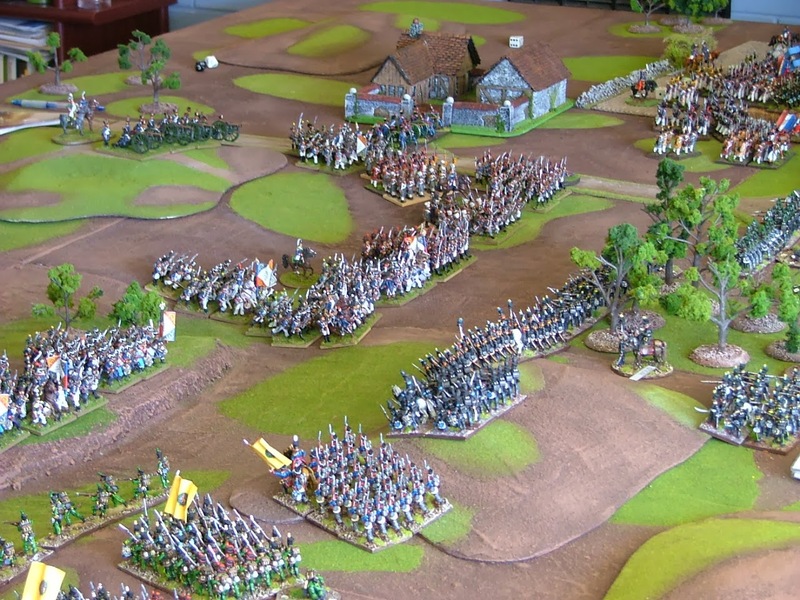 Byljandt and Saxe-Weimar advance cautiously in the centre. It was at this point that the allies were to experience what was to be a perennial problem during the battle. Despite excellent initiative dice rolling from our glorious Prince of Orange (Andy Morant) we could not roll an order change to save our life. Having deliberately been somewhat defensive in our initial set-up and order allocation, we struggled to roll what would even remotely allow us the opportunity to send reserves where they looked like they may be required. The Prince of Orange wins another Initiative roll...however his order changing die were another thing completely!! On the Allied right, around the outskirts of Bon Chance the Brunswickers were faced with a dilemma. As Marcognets Division advanced it became increasingly obvious that reinforcements were going to be hard-pushed to arrive in time to fully support the position. Thus Butler made the decision to advance the 1st and 2nd Brunswick line battalions in order to help hold up the lead French battalions. 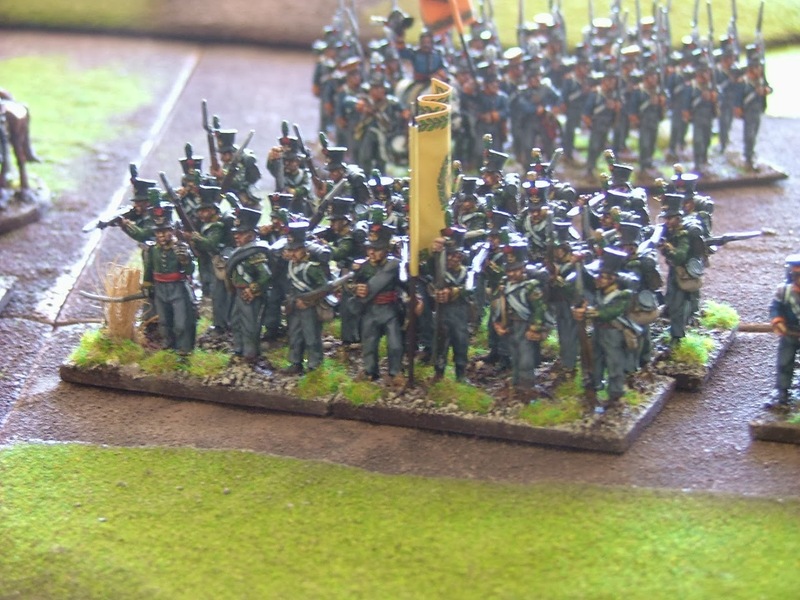 This was a risky strategy considering the morale class of these troops however the Brigadier felt that there was no other choice. 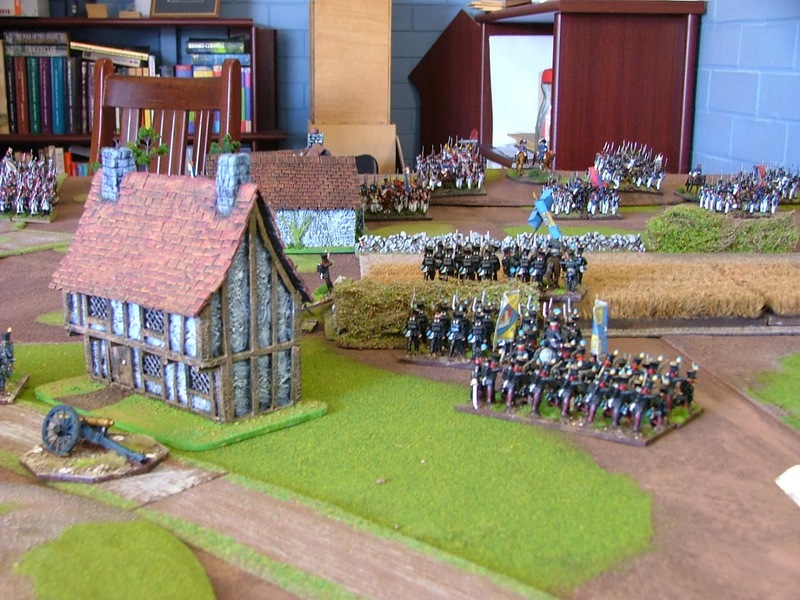 From the distance the Duke of Brunswick nodded his approval as the troops made their way to the cornfields. 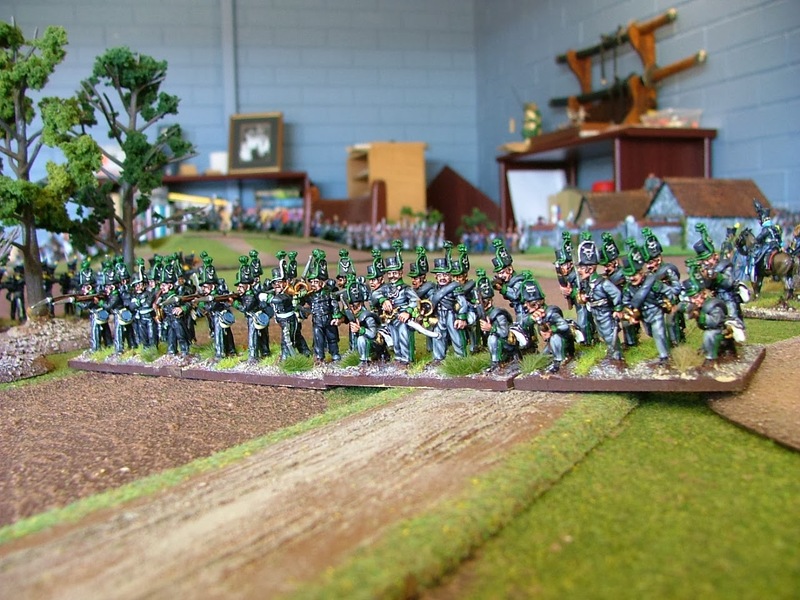 The brave 1st and 2nd Line Battalions of the Black Brunswickers advance. 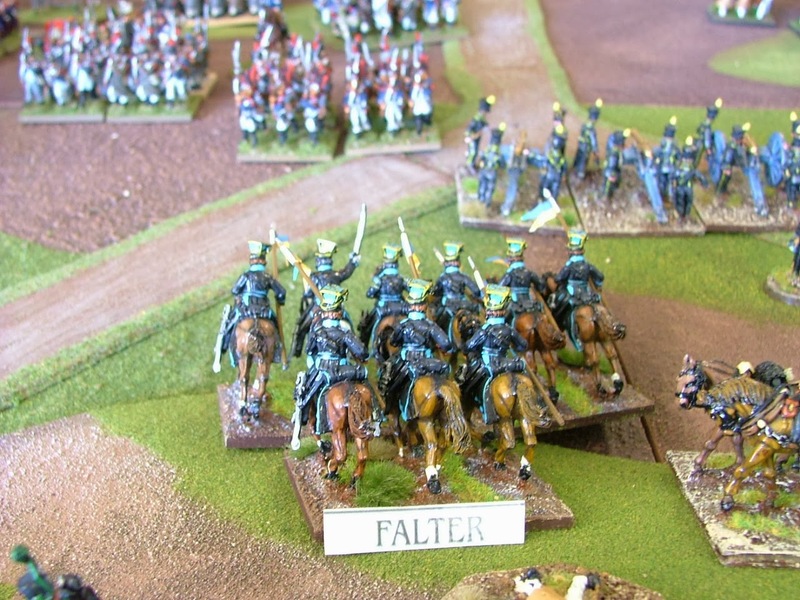 In order to further support the right flank, Buttler also sent aides scampering to the cavalry Brigade situated on the hill to the left of his brigade. 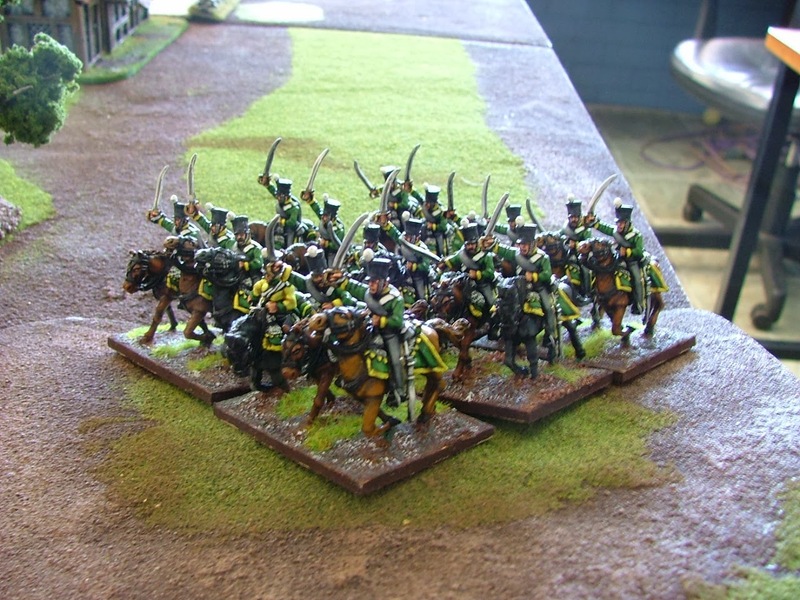 This formation commanded by General Ranschenplatt consisted of four squadrons of the Black Hussars and one large squadron of Brunswick Uhlans. Despite rumors of a falling out the night before between the two commanders, Buttler was confident that Ranschenplatt would see that his original orders (To support Saxe-Weimar and Oflermann in the centre against French attack) would be irrelevant and futile if the extreme right was broken through and the crossroad around Bon Chance taken. Back on the allied left flank the French screening was working well. Pack was caught up in the cornfields and perceived pressure on General Perponchers division and Byljandt brigades in particular in the centre was preventing a fast advance from the Dutch-Belgians on the French formations to their front. 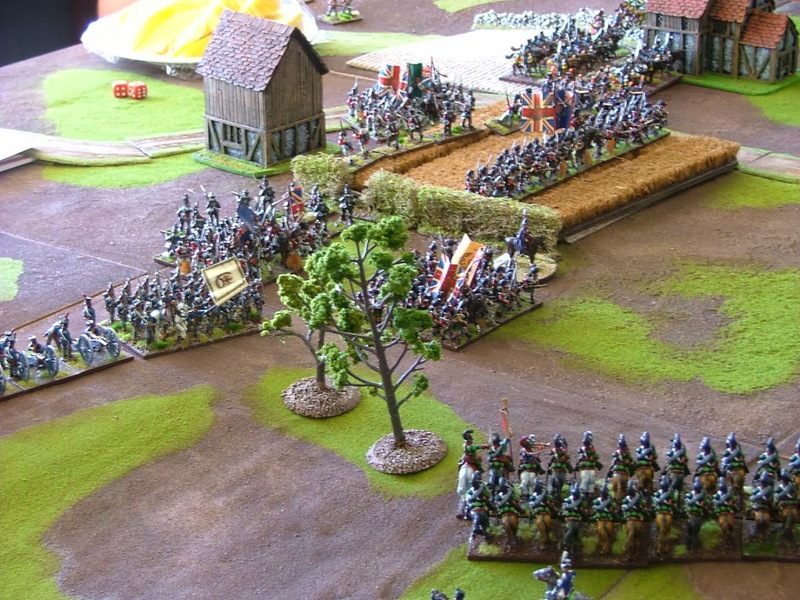 Noticing this the Dutch cavalry commander General Merlen took the opportunity to change his orders and attempt to advance around the perimeter of the village so as to bring pressure on the motley screening force holding up one third of the army. 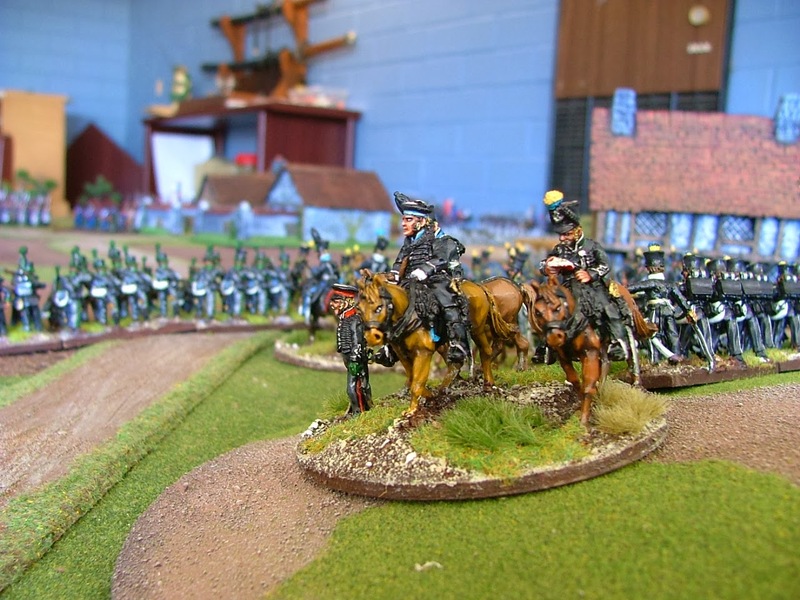 and the 6th Dutch Hussars with Horse artillery in support. left and centre. They were to soon easily drive off the exposed skirmish screen. encouragement to his crew on the hill. 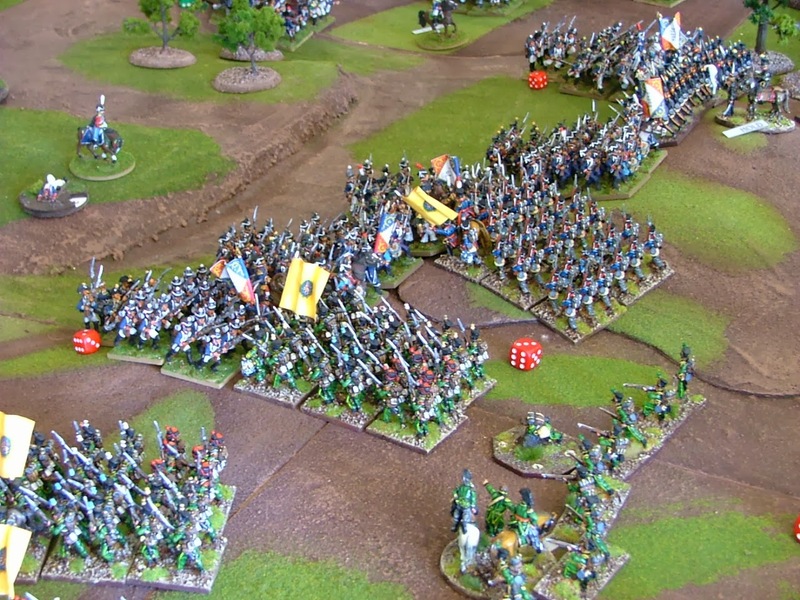 To the immediate right of Marcognets Brigade, D’Erlon had ordered a force to attempt to directly put pressure on the crossroads defended by the Brunswick Foot artillery and a battalion of the Avante Garde. He had also allocated the corps asset of a battery of twelve pounders commanded by Major Martine Rue. He was always known as a commander of quality with an eye for opportunity (both on and off the battlefield!). Today was to be no different. 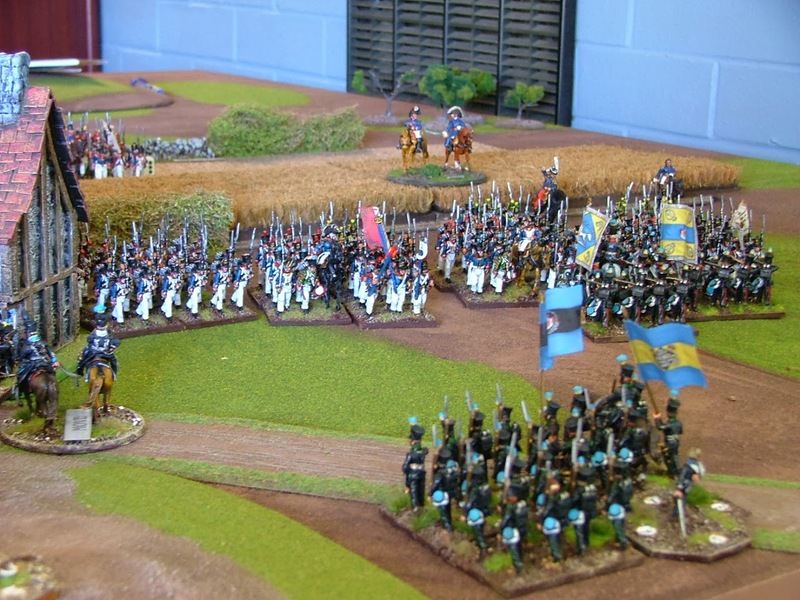 Brunswick Artillery and Avante Garde defend the crossroad. Around the cornfields on the Allied right the clash between the two advance Brunswick Battalions and the advance elements of Marcognets Division clashed. 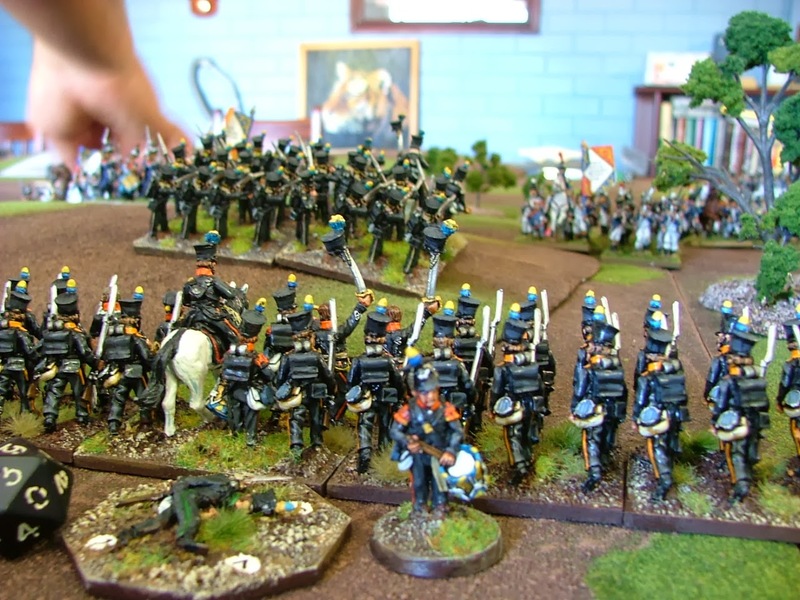 Despite being outnumbered and without their volley inflicting significant casualties on the French, the brave boys in black managed to halt the French strike and then retreat in good order a few hundred yards behind and set up a second line of defence. Slightly different view of the action on the right. ...and fall back to a second line of defence. 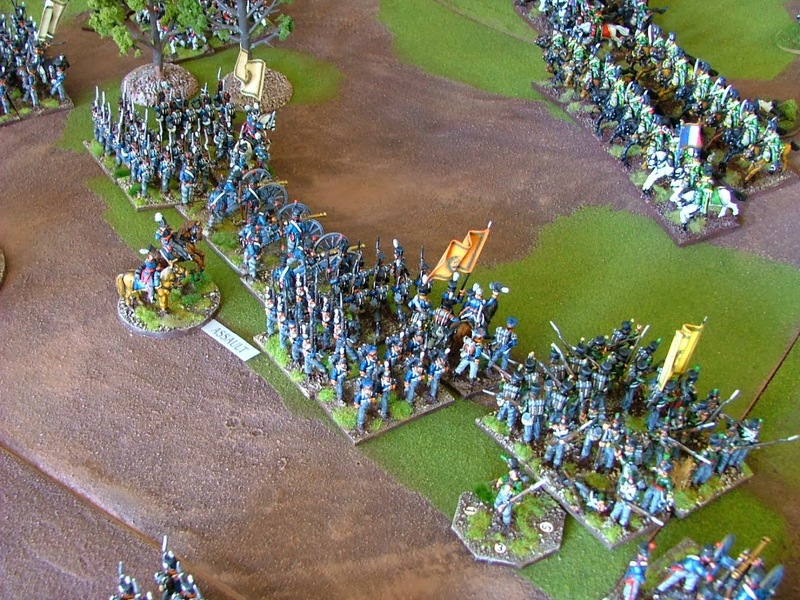 In the centre, Byljandt continued his slow advance forward, fresh orders for him to push forth against the feeble French screen to his front not being forthcoming from the upper echelon of command. defencive ridge line - will it make the difference? To the right of Saxe-Weimar, the Brunswick Light Brigade under Olfermann could see the advancing elements of Aulds Brigade. 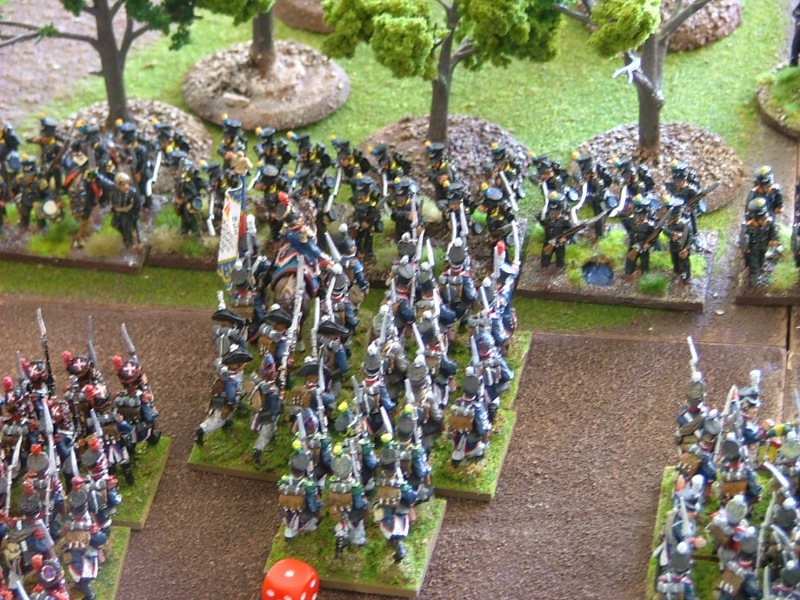 The French were determined to take this position and therefore have freedom to swing down on Butlers left flank via the woods. ...against these lads look more formidable and than Marseilles fans on tour! As the battle raged on the allied right flank, the news that Buttler had been sweating on arrived. 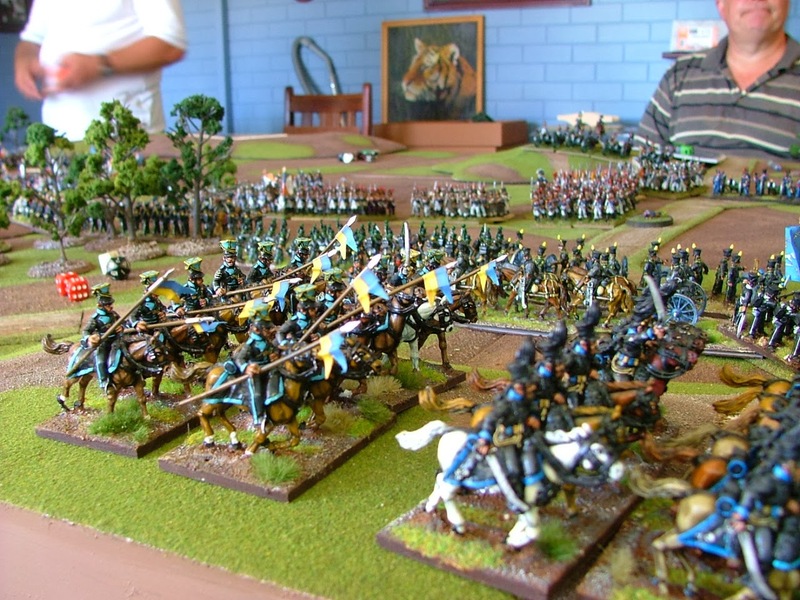 The Brunswick light cavalry with Horse Artillery support was finally on the move and heading towards the extreme right of the army. 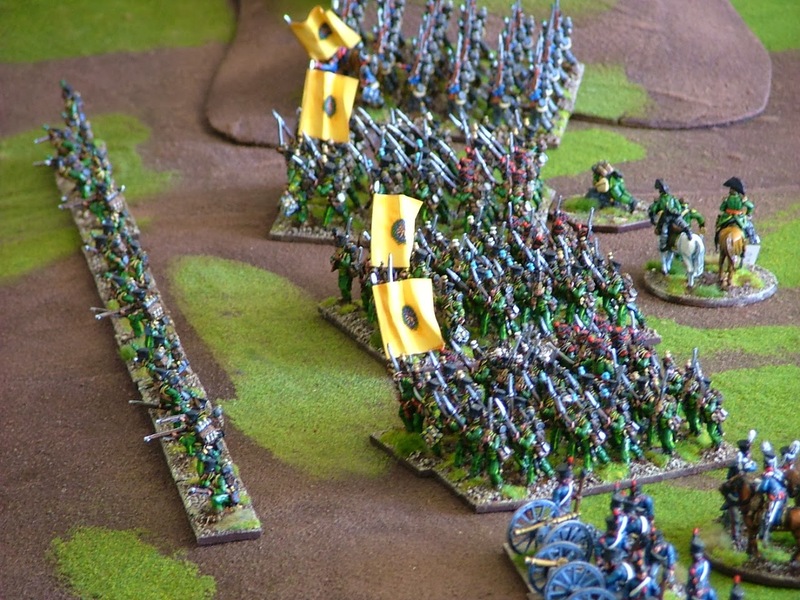 This would then force the French to either take the risk of pressing forth their attack across open ground and exposing their lead elements to the enemy cavalry or forming squares and presenting wonderful targets for the horse artillery. 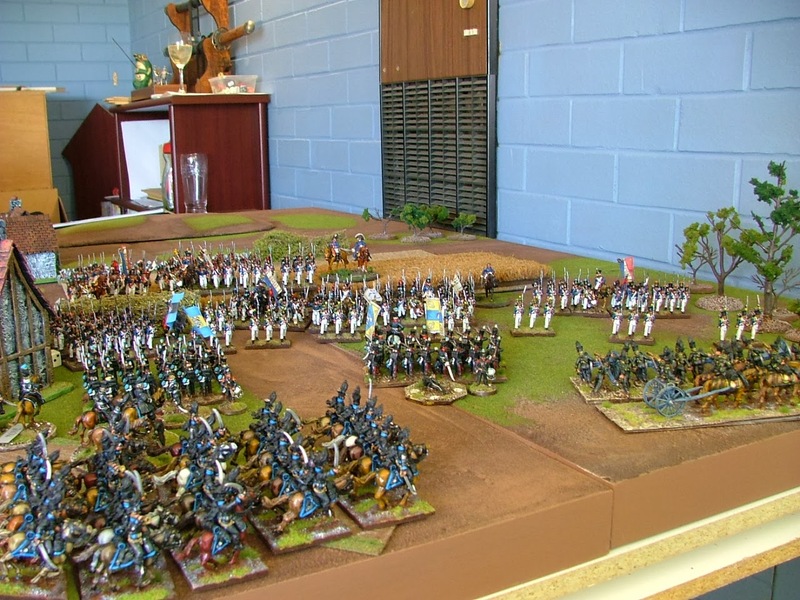 Brunswick light cavalry on the move. On the hill to the rear of this shot, Major Rue commanding the 12pdr battery sees a nice fat flank! Don't quite know the story with the Tiger on the wall - Steve???? 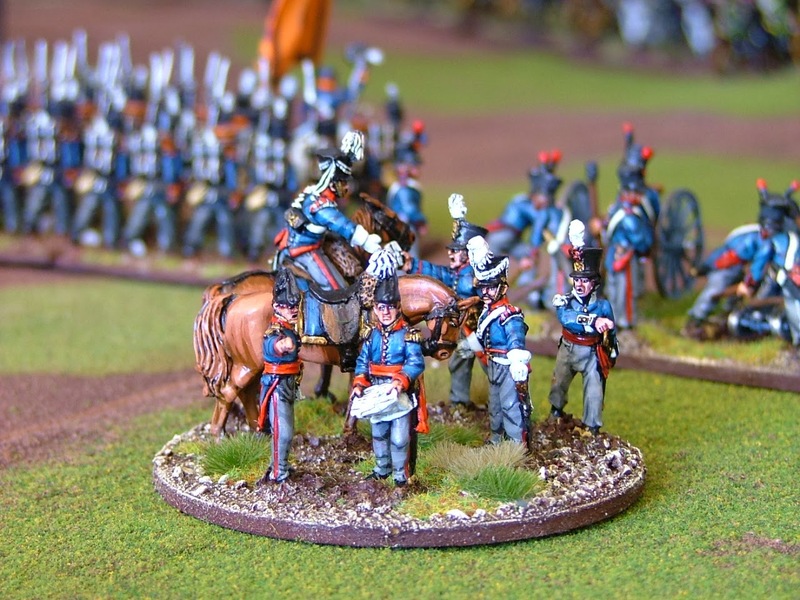 The French see the opportunity to cause some damage to the Brunswick Hussars and fire a speculative barrage of ball. However Major Martine Rue is a lucky fellow. 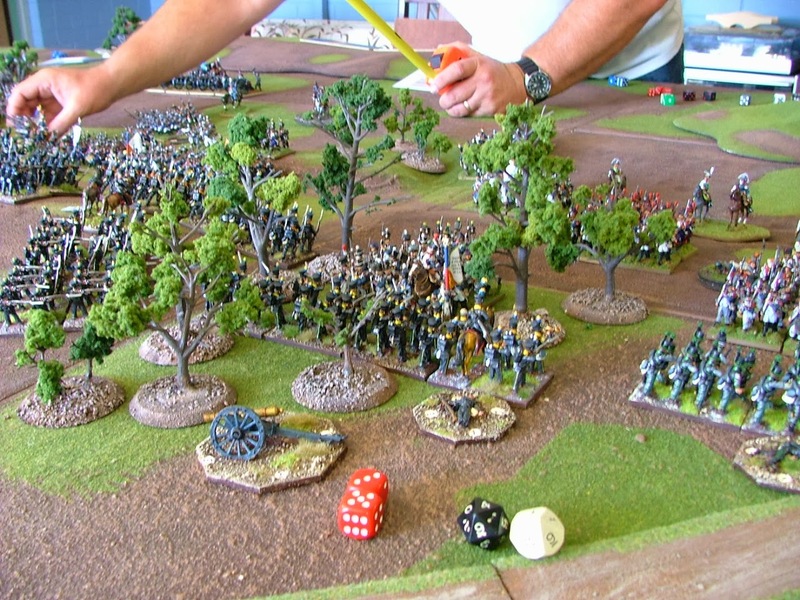 A double six is rolled, Ranschenplatt is killed instantly and the formation falters in disarray! The unfortunate General Ranschenplatt receives his final order! The unfortunate General Buttler is now on his own. Back in the centre, elements of Quiots Division start to build pressure along the Dutch-Belgian front. Commanding a Brigade himself, he and Bourgeois push their columns forward at full speed. Unfortunately for the allies, their fire upon them is sporadic and ineffective. 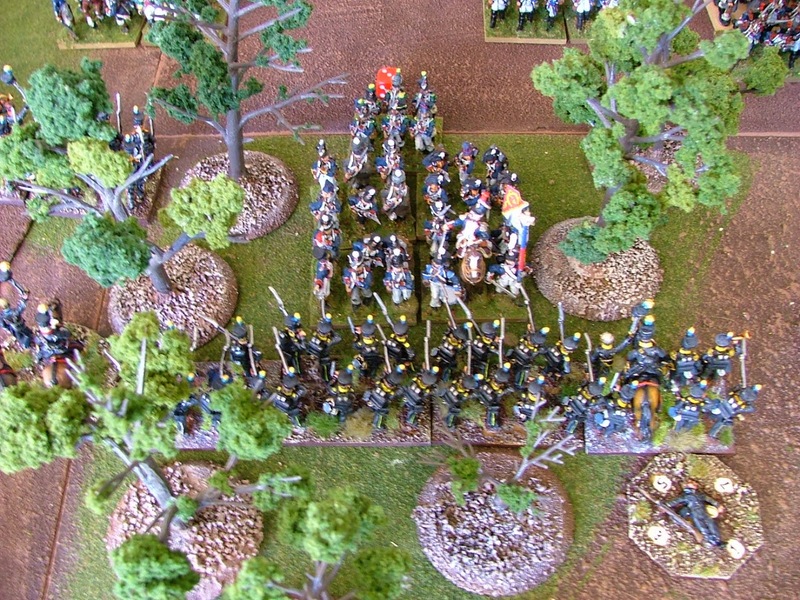 On the allied left, Pack is still being obstructed in his advance by screening French cavalry who have forced the lead battalion of the 42nd to go into square. Merlen, despite the delays of traversing the town heads off to alleviate the pressure on Pack and free up the formation to move aggressively onto the French right flank. 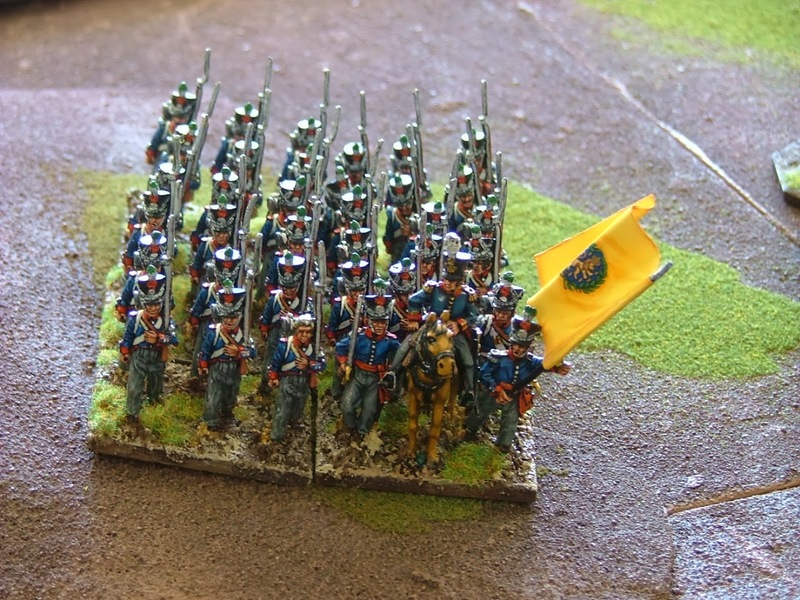 Half the Anglo-Dutch Corps held up by one regiment of French!! French General Staff look suitably relaxed. 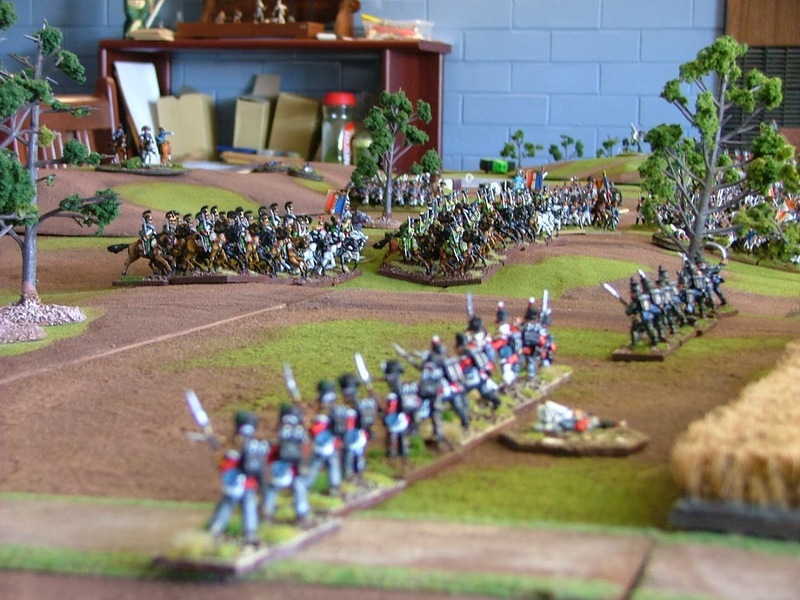 Aulds attack on the woods defended by the Brunswick Light Brigade now starts to see some increased and dynamic activity. Despite the fire of the Avante Garde and the 1st Light battalion, the advancing French columns are unfazed and determined to press forward the advantage that their formation will give them in a hand to hand fight. 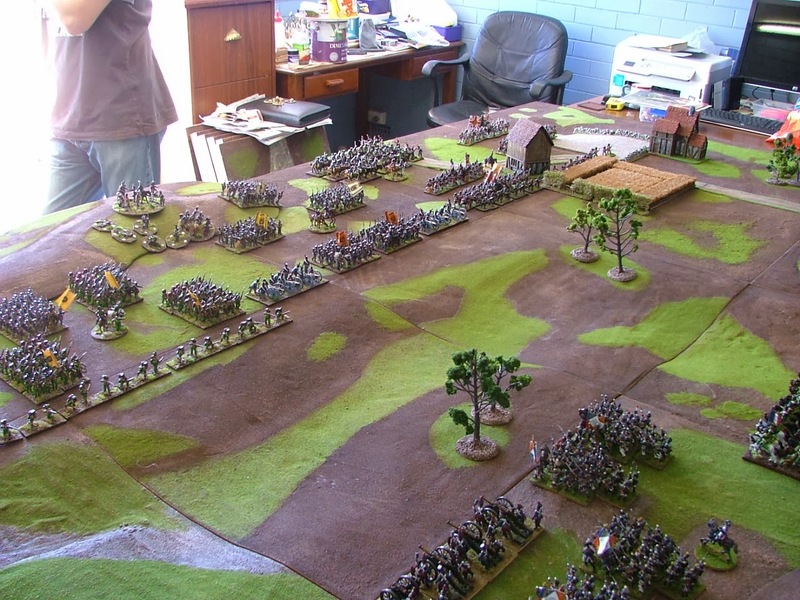 The battle for the woods becomes fiercely contested. The moment of truth for the possession of the crossroads. The point of impact one could say! 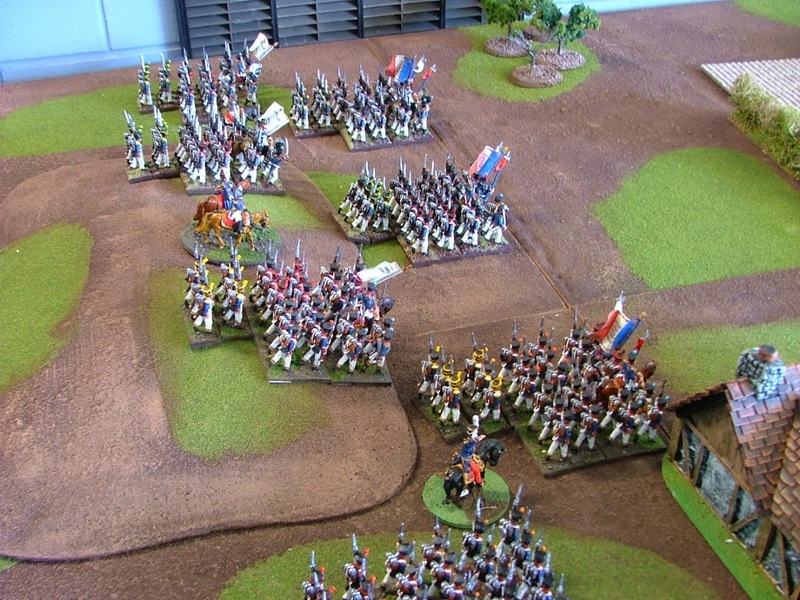 In the centre the French also start to press forward against the Nassau brigade of Saxe-Weimar. Largely left in reserve, this formation was made up of variable quality troops in terms of morale but their strategic deployment was sound. Saxe-Weimar remained confident of seeing off the French Imperial threat. With all speed the French, having put their hopes in an all out attack across all fronts with very little in reserve launch charges across a wide front. Same action with the Dutch - Belgians looking on. 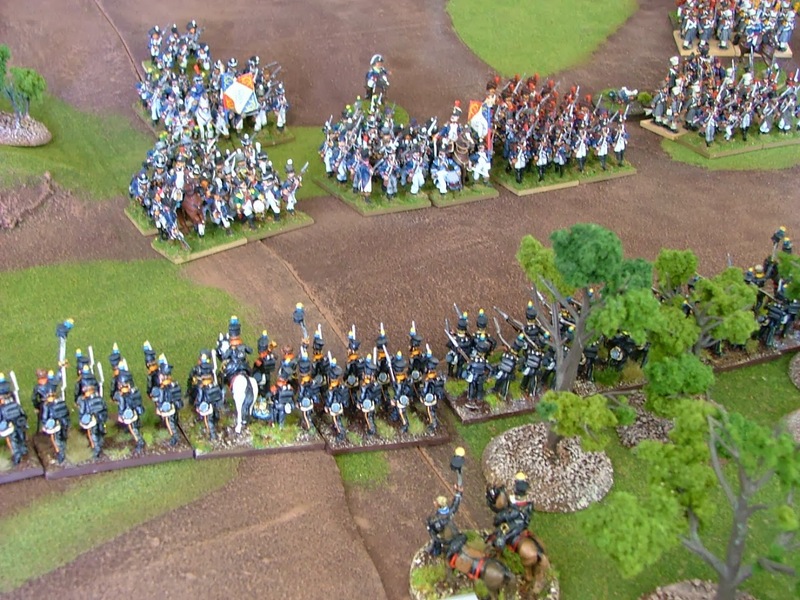 Despite a withering volley of defensive fire across the front, most of the French Columns hit home, pushing back the Nassau and the 28th Chasse-Orange Regiment. The consolidation of the French advance is now very much taking shape. 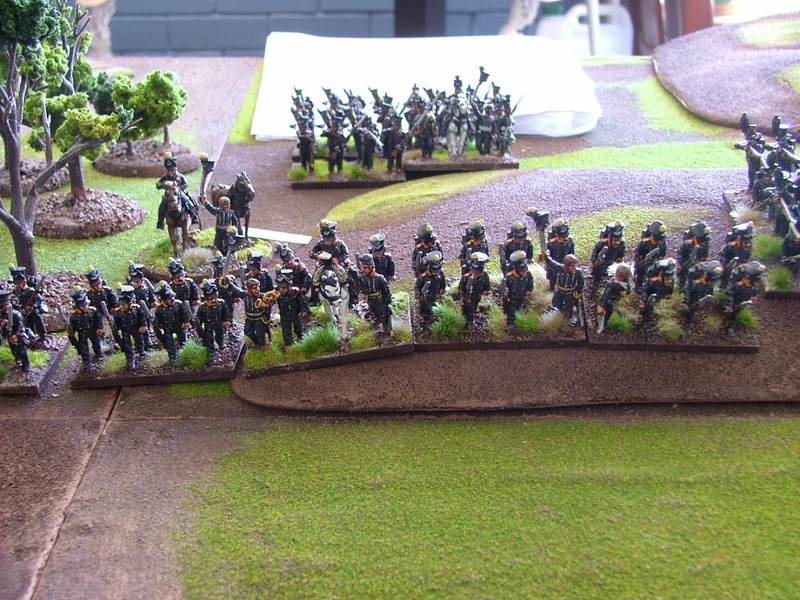 However Merlen and his intrepid brigade of Dutch-Belgian cavalry are still intent on causing a good deal of discomfort to the French cavalry. 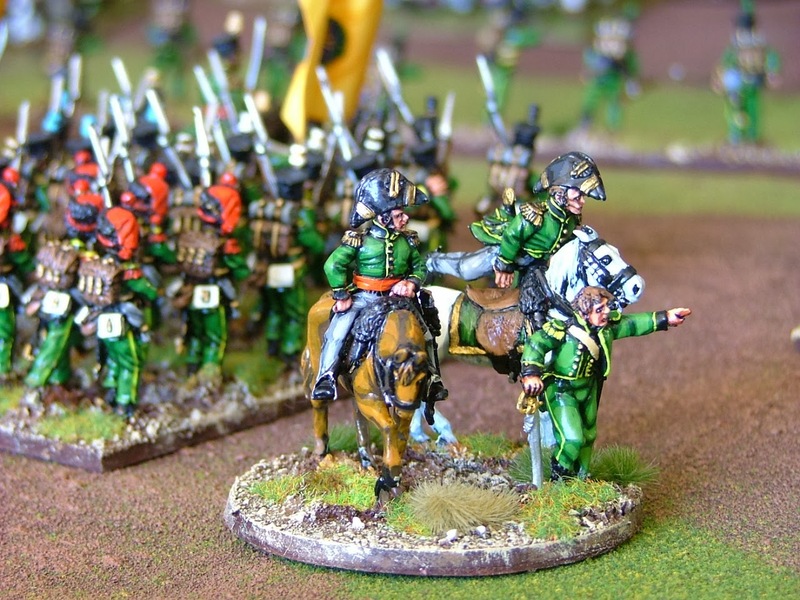 With great élan the 5th Light Dragoons engage and force the French Chasseurs to retreat in disarray. 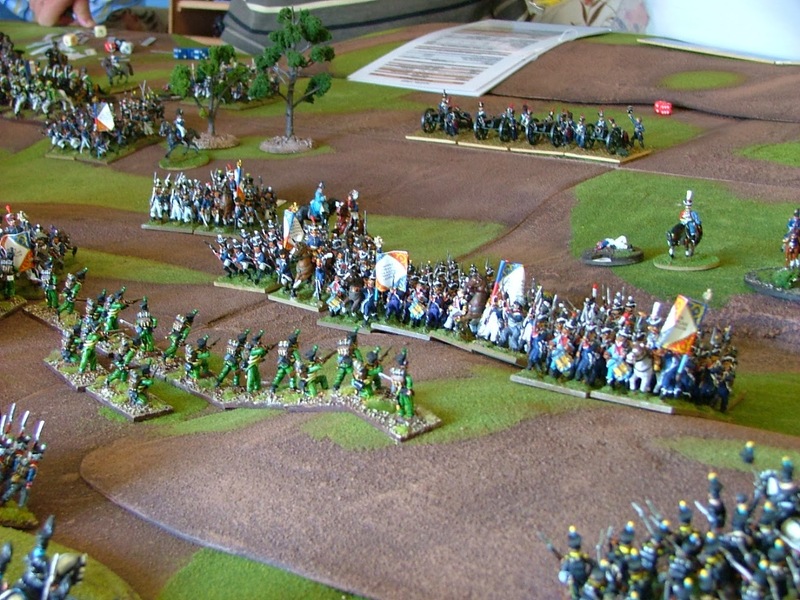 whilst the 8th Hussars look to expose a flank. prepare to see off the dismayed Chasseurs. 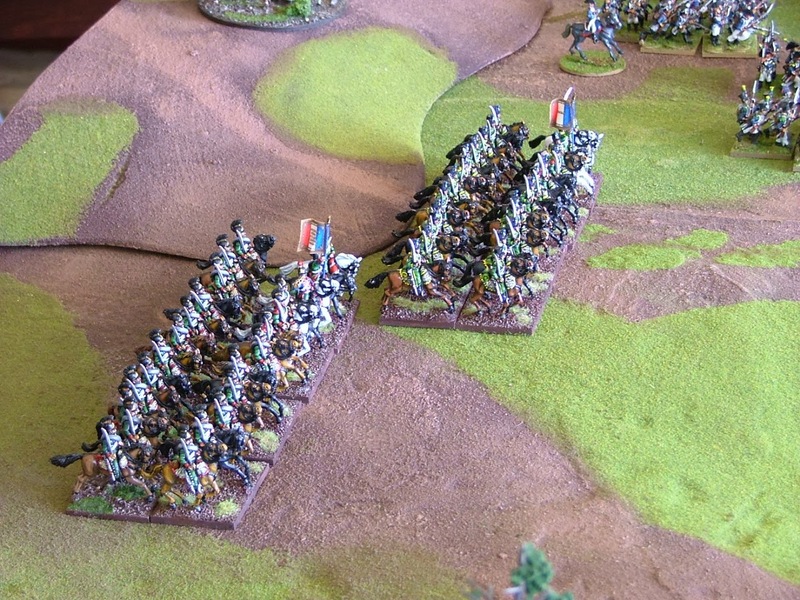 The cavalry battle goes well for the Allied cavalry until the French roll a Double Six and turn a certain rout into victory and Dutch disarray. Double six translates into Dutch disaster!! Back on the Allied right the French attack on the crossroads reaches climax point. 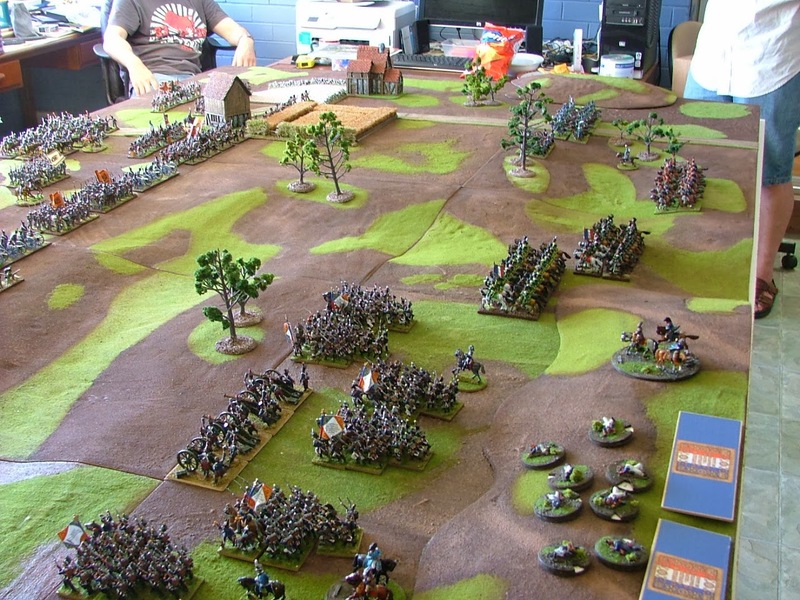 The Avante Garde fires a withering volume however the French still hit home and defeat the veterans easily, opening up the position. However all is not lost. 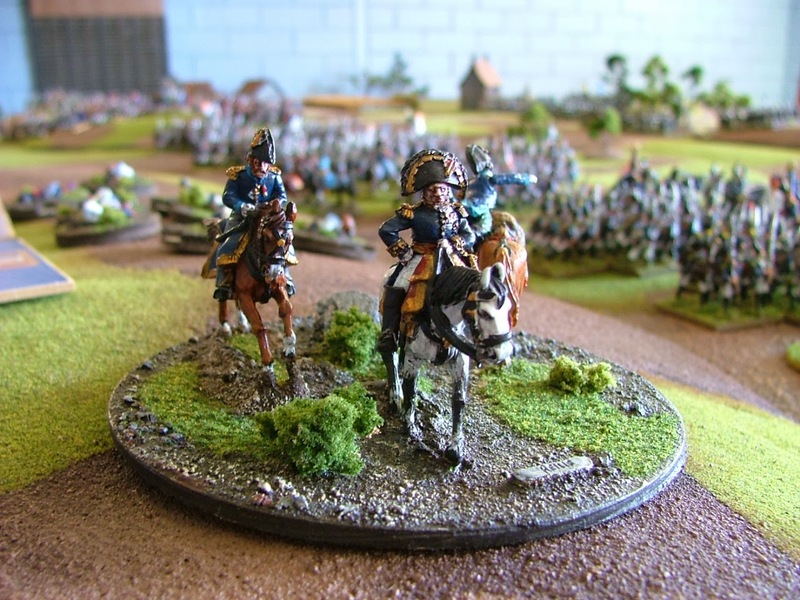 The Brunswick cavalry of the now deceased Ranschenplatt has hardly played a part in the battle so far. 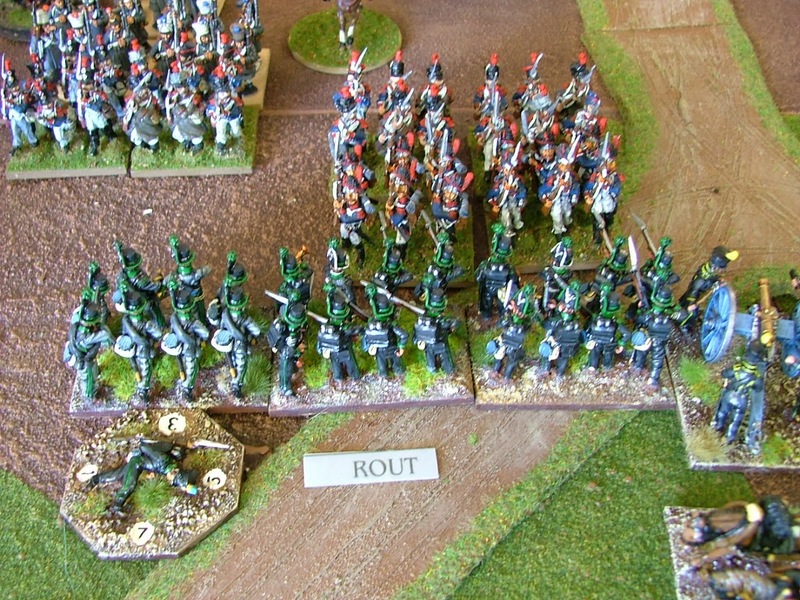 Yet the chance for glory remains as the Uhlans see the now unformed and disorganised French battalion hurriedly rushing to regain composure. 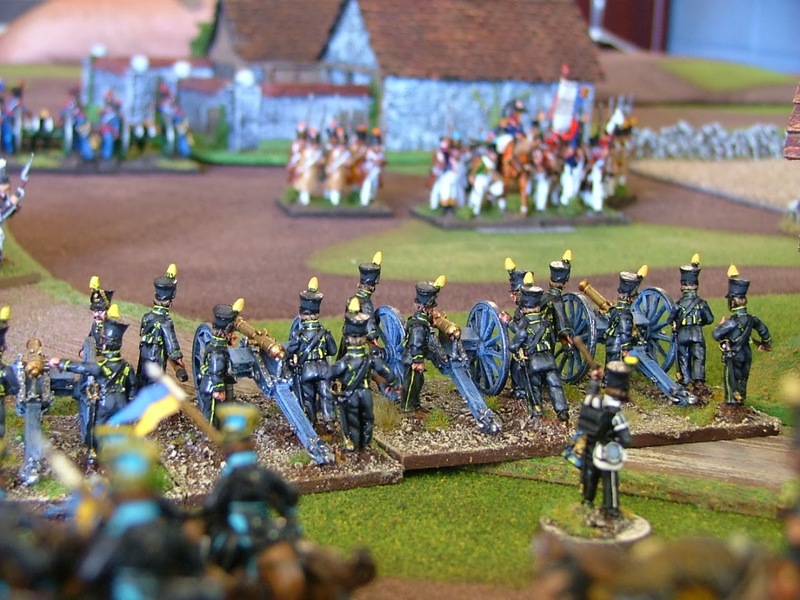 The French commander sees the threat, realises that he will not have time to form square and yells for an emergency volley to be fired as he grits his teeth and prepares for the worse. He needn’t have worried. 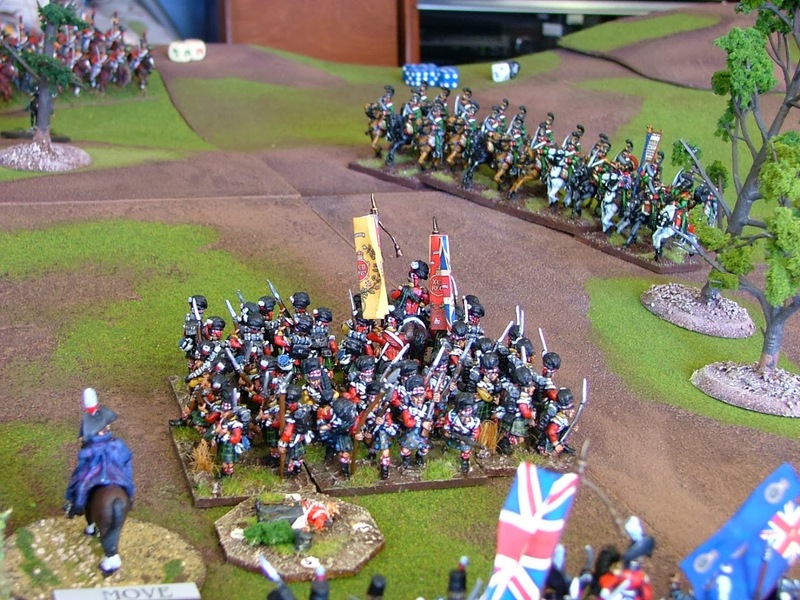 Martin rolls another double six, the Uhlans falter and the French are saved. Bloody hell!!! 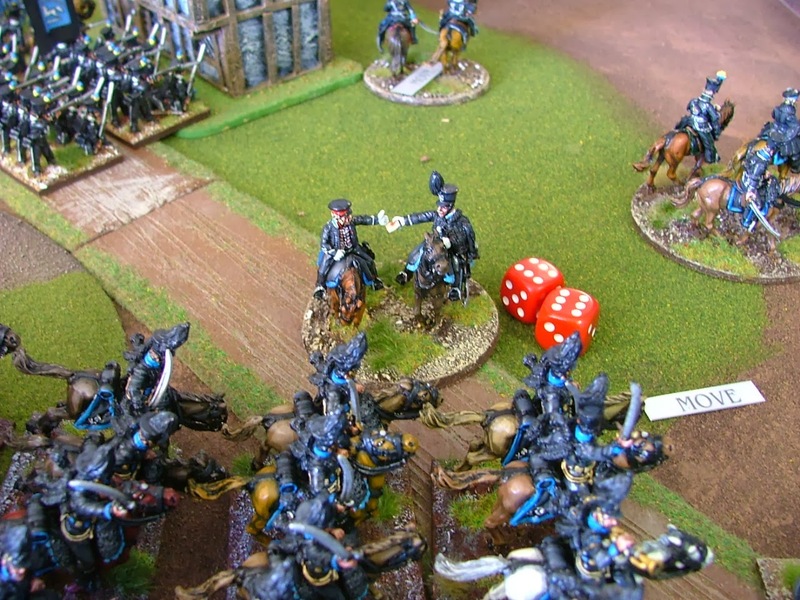 Uhlans cop an unlucky, but by now predictable, bad break! DB Jaegers look slightly non-plussed by the goings on. Crucial times on the extreme right as well. 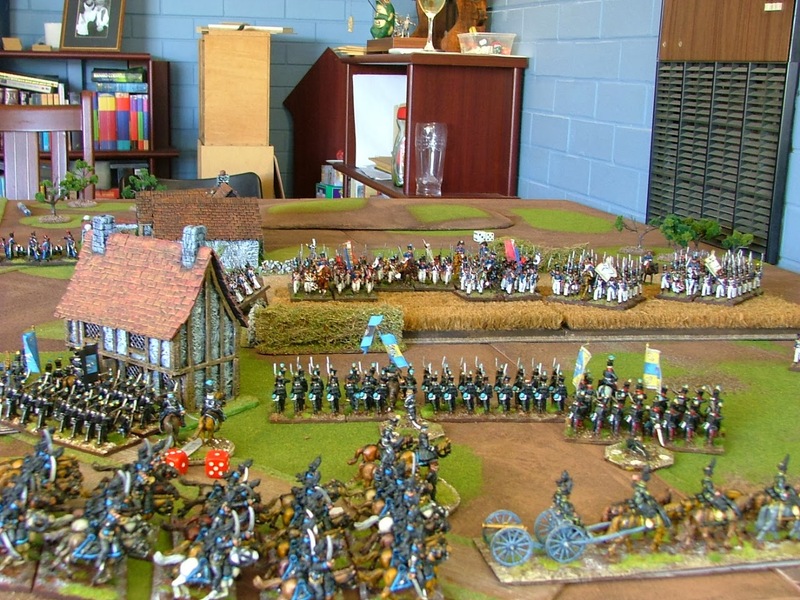 On the extreme right flank the brave Brunswickers are now completely overwhelmed by the elements of Marcognets Division and the reinforcing brigades. 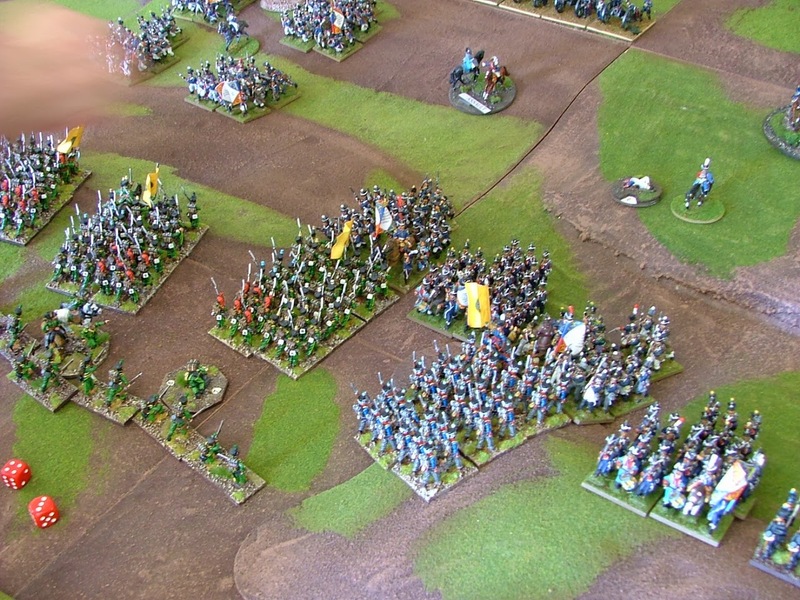 Units finally rout and the entire position is lost. back and the Jaegers attempt to take a few victims before they leave. 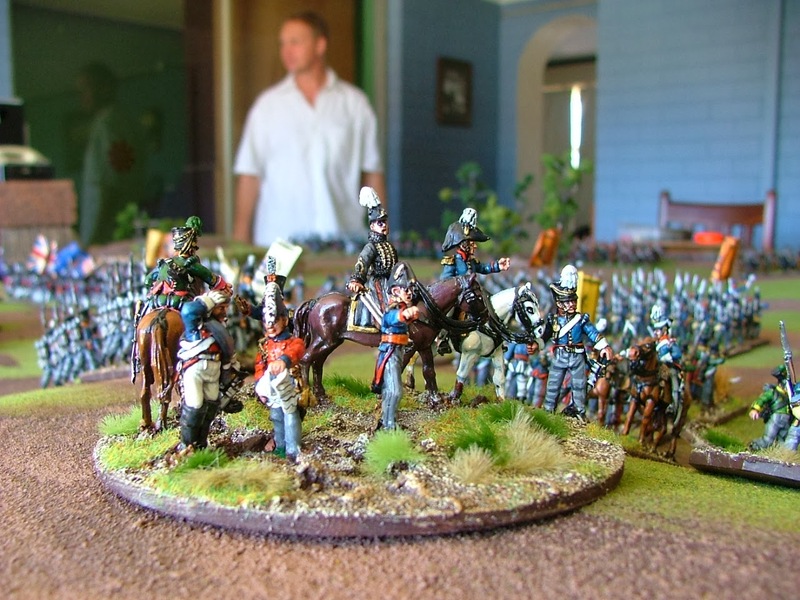 View at the rear of the Brunswick Light Brigade - beat those drums Hans!! 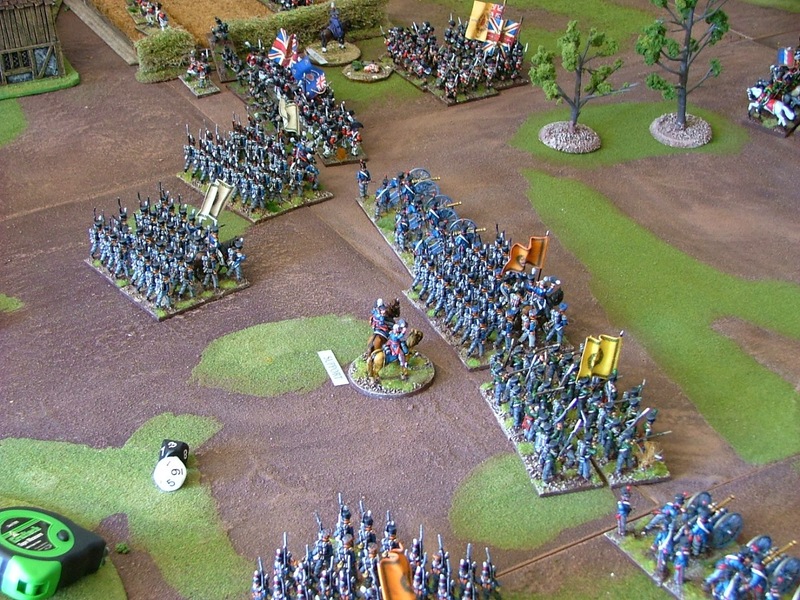 The DB Infantry decide that forming square may be a good idea. Considering the situation I must admit to looking decidedly calm. At this stage, the allied high command decides that it needs to get what remains of the force off whilst it can so as to at least be able to contribute to the campaign further in the week. 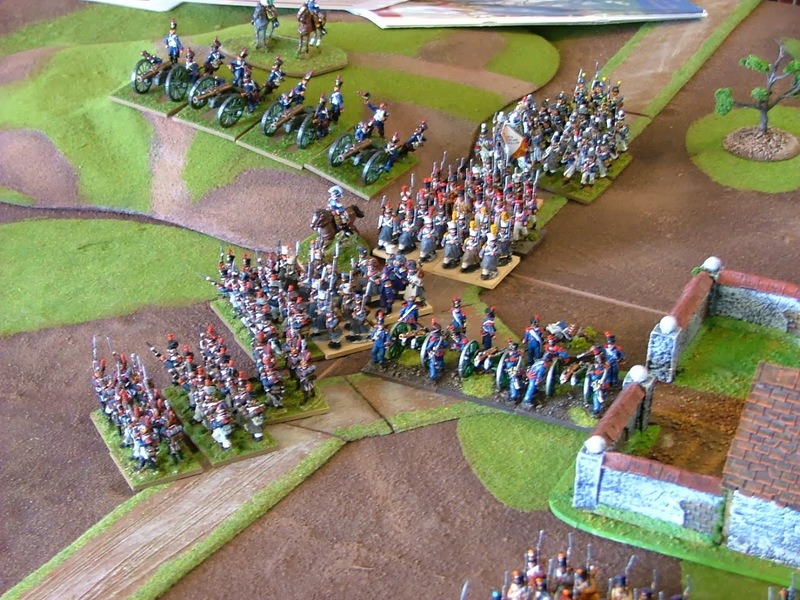 Our French opponents, ecstatic with the success of their plan happily take the positions and look at their cavalry which remains relatively in tact. 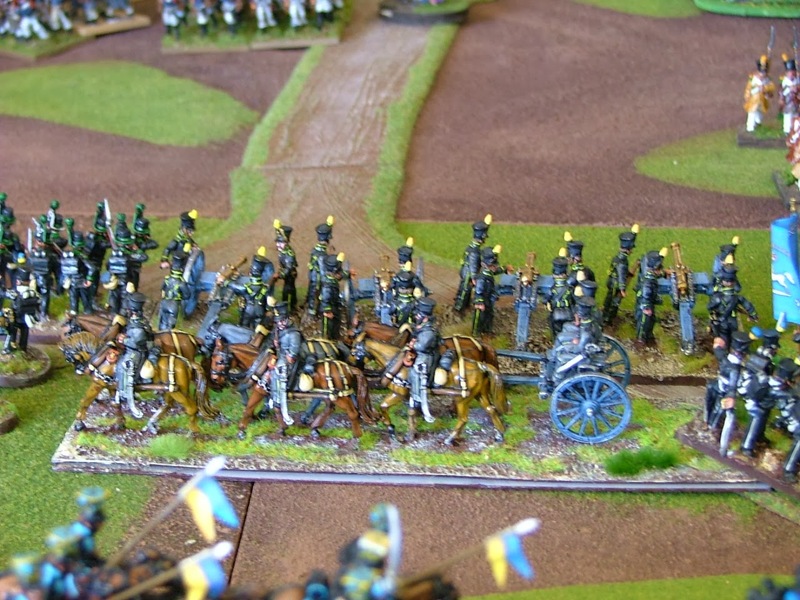 Packs brigade also has managed to finally clear itself of the difficult terrain and is able to bring some fire to bear on the French Horse artillery that has been mercilessly striking at its ranks throughout the battle. escape. The rest of the corps will soon follow. Pursuit may well be on the agenda. Great stuff Carlo. More more more! 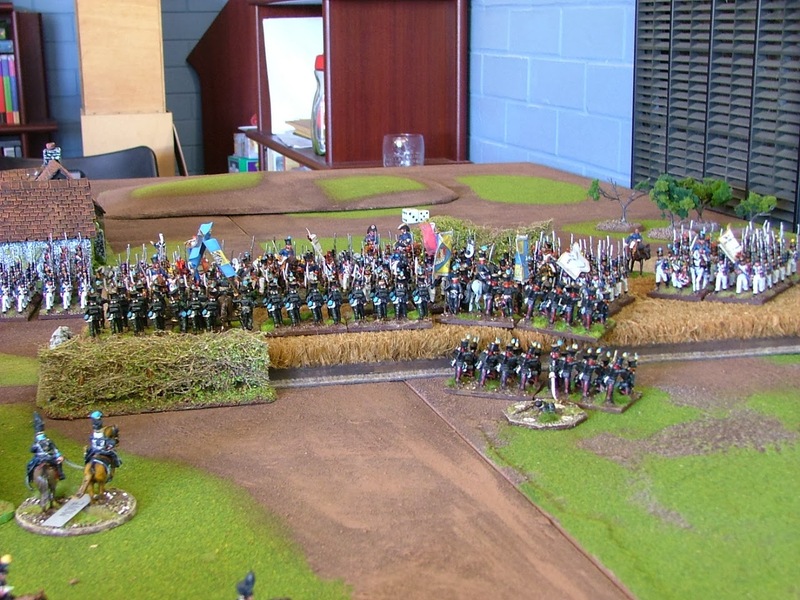 Thanks Peter - the game was great fun and despite my poor photographic skills there were some lovely troops on show! Great toys on a massive board - right up my street. Thanks a lot Jeremy - really appreciate the visit and comments mate. Sweet game and report. I doubt Grant and I will get that much of a force together. Thanks Greg. Great to catch up on the weekend at Cancon mate. Grant and yourself don't age at all! Thanks Mark - it was great gun and most of these boys will be getting a few outings this year. Great report and superb looking table. The troops - magnificent. Bravo, Carlo! Thanks so much Peter - it was a fun game mate.